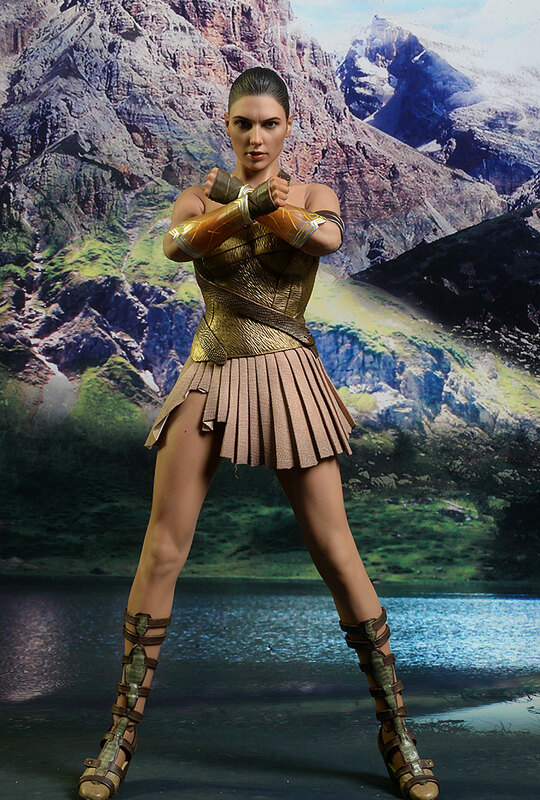 Hot Toys continues to tap into the Wonder Woman license, and who could blame them? She's the most popular current DC character, and they'd be fools to not strike while the iron is hot. The newest release is the 'training edition', based on her look early in the movie when she's still becoming all she can be. It's certainly a unique outfit, and a different hairstyle as well. She just started shipping, and will run you around $235 depending on the retailer. There's some spot embossing, but there's also spot textures, adding a very interesting tactile aspect to the outer slip cover. Inside, the plastic trays keep the figure and accessories safe and sound. It's all collector friendly too, with no real damage required to free her from her plastic prison. There's no doubt this is a realistic, life-like portrait. The amazing, subtle skin texture, the detailing in the hair, eyebrows, and lips, and the sharply defined teeth create a far more human appearance than you see in much larger sculptures in wax museums. I dig the expression too, with just the right amount of concern and seriousness to the look, without being overly constipated. It works with a variety of battle poses, ideal for this particular version. But there's a couple issues that really hurt the final product for me. First up, I'm not loving how the final hair sculpt came out. The detail is good - especially in the braiding in back - but there's a weird sloping to her forehead and a pointy front on the top of the hair. It doesn't look too bad from the front, but gives her a Neanderthal look from the side. It's also not the most accurate. The nose is a little too large and long, and the sloping face accentuates the pointy look. 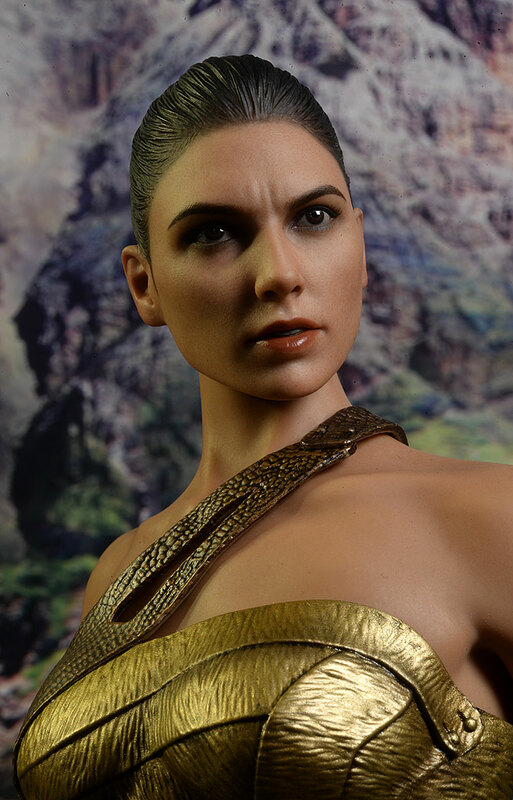 It's the least accurate Gadot portrait they've produced so far. It's a pity too, because there's a different aspect of the 'sculpt' that I really love - the rubber skin. It's sculpted on the legs and arms with an accurate musculature, and the knees look terrific. While the sculpt might be off in accuracy, there's nothing off about the paint work. It's the usual perfection that we've come to expect from them every time. The hairline is subtle, with a soft transition from hair to skin. The eyebrows are sharp and clean, as are the eyes, with very little bleed. The makeup around the eyes looks great, and the bright, wet lips allow the white teeth to stand out in hand. The torso, arms, and legs are covered in rubber skin, and the match between the tone on the face and the rest of the body is good. The costume doesn't have a ton of paint detail, but the colors are good and edges are clean. This is not a particularly articulate figure, thanks to several issues. The rubber covered neck creates a tight fit with the head, and there's not much tilt or lean action because of it. The shoulders and elbows are restricted by the skin as well, as you'd expect. The torso is a non starter - there's no movement at all, thanks to the thick, plastic costume. The ball hips work well, and the knees are a little better than I expected, even with the skin covering. The ankles would normally work great, but the strap boots can only bend and twist so far. The instructions even warn you against damaging them. But the biggest problem, at least as far as I'm concerned, is the annoying wrists. The pegs are tiny, and difficult to get inserted into the small, deep holes in the hands. The hands pop off constantly if you don't get them all the way in place, and that's really hard to do. Working with them was quite frustrating, and took away any fun in posing her. 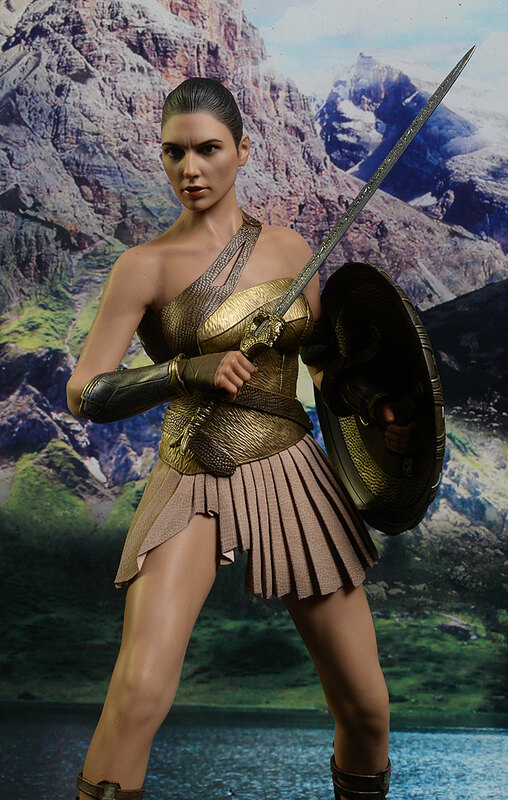 Diana comes with a variety of extras, including weapons. 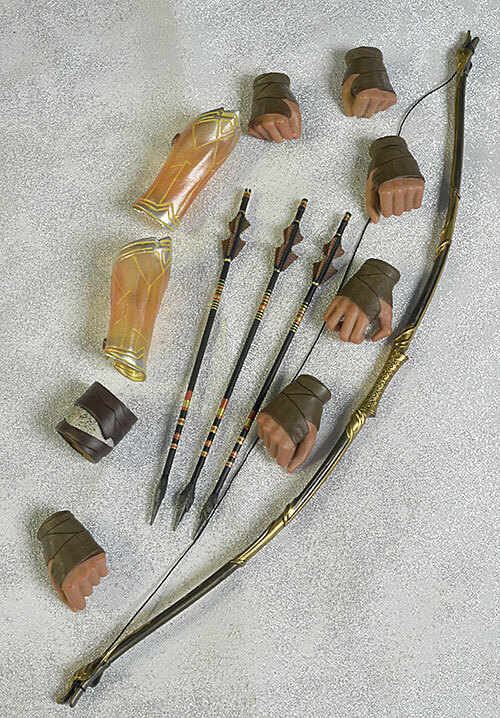 There's eight hands in total - a set of relaxed hand she comes wearing, and a set of fists, a set of tight grips, and a set specifically designed for the bow and arrows to swap in. As I mentioned earlier, these pop off far too easily unless they are fully pressed into place, and that can be quite difficult. There's a couple extra wrist pegs just in case too, and you might want to attach those to a couple of the most used hands and leave them there. Like we've seen with previous releases, there's a second set of gold gauntlets that can be swapped for the silver set she comes wearing. 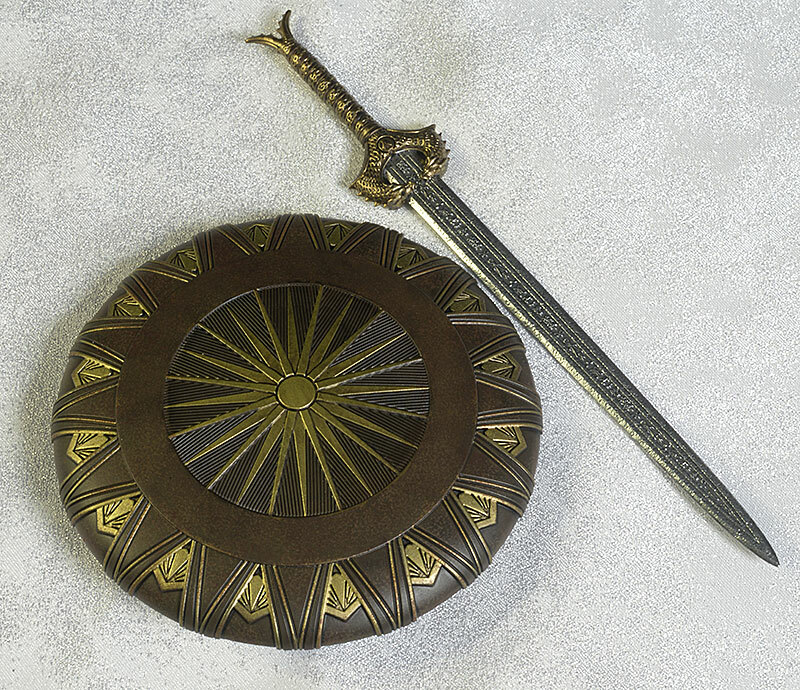 There's also her shield and sword from her movie, both with excellent sculpts and paint. The sword can be inserted in the display base, where she found it. It looks pretty good this way, and I always like getting diorama type pieces like this. 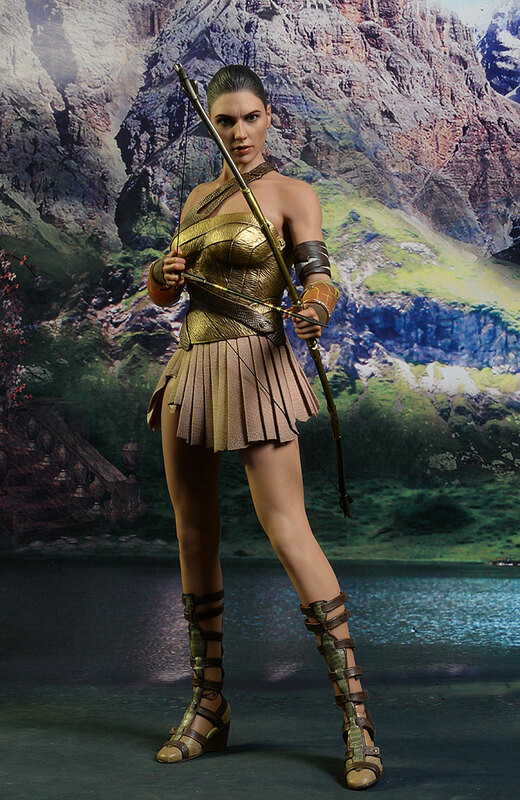 She does not have a lasso, but she does have a bow with three arrows. The arrow sculpts are great, except for one minor detail. They are really short, so while the body will allow you to create a cool, drawn bow stance, the arrows are too short to reach from the back hand to the bow. These things are closer in size to crossbow bolts than longbow arrows. There is a bandage for her upper arm included, and with a little effort, you can work it up over the rubbery skin. I will probably leave it in place - I like the look. 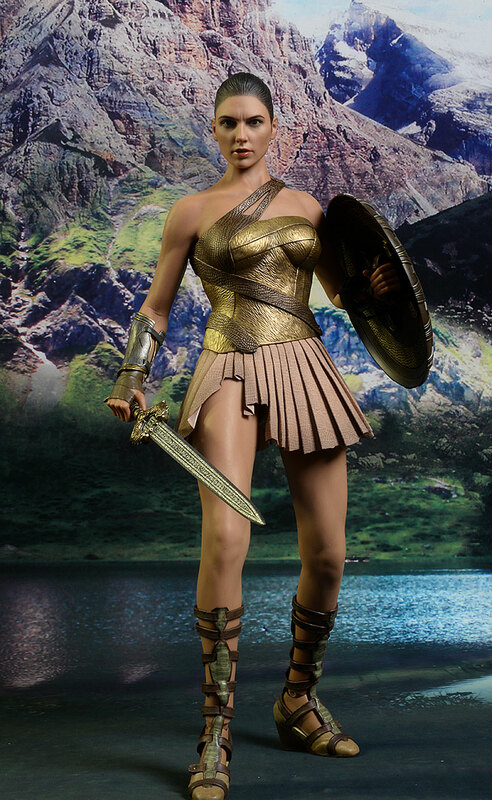 Of course she has a display base, with a fairly complex Wonder Woman logo on the front and a support rod. And like many of the recent releases, she has a cardboard backdrop. I didn't end up using it in any of the photos, and I'm not a huge fan of these because they are simply too small to be of much use. I really like the outfit, although the stiff plastic upper piece completely restricts the torso. The sculpt on this piece is great though, and it blends in with the cloth skirt pretty well. You've seen the gauntlets before, but the strappy boots look fantastic. You can get some movement out of the feet because the straps are rubbery, but take some care. With frustrating wrists and very little overall articulation, you won't be reposing this figure a lot over time. I suspect you'll find one look you like, and leave her that way for a long time. Hot Toys appears to be pushing up the price for their average releases again. 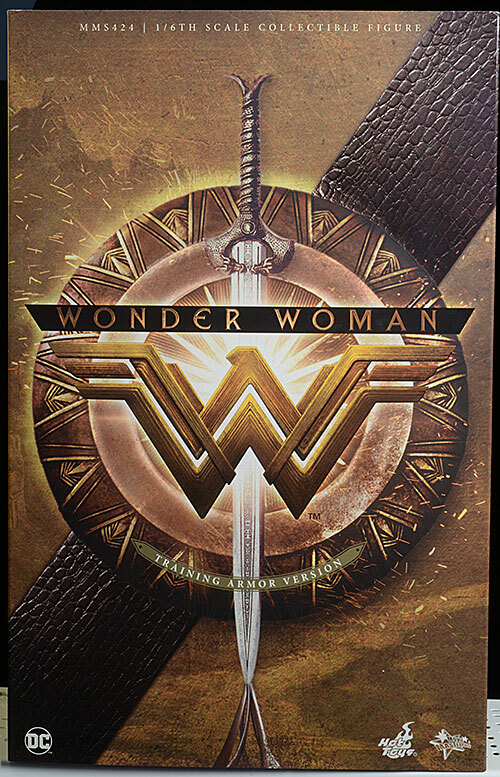 Wonder Woman is up to $235, and I'm not seeing anything about her that demands the higher price. She's a solid $220, and if you can find her at that price you can add another half star here. Not much. Take care when messing with the ankles to avoid damaging the boots, but you should be good otherwise. There's a lot of good with this figure. While the rubbery skin does take away from the articulation, you can find some good poses and the seamless look is great. The outfit is terrific, especially the boots, and the accessories are a highlight. Ah, but that portrait. 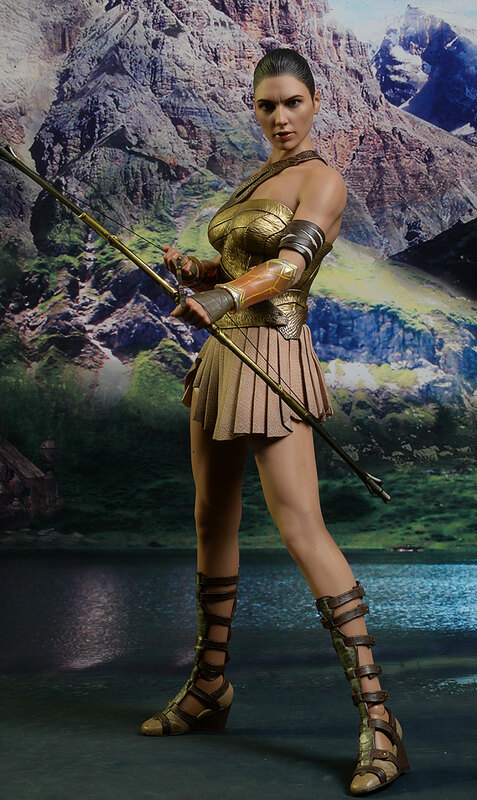 It's realistic, sure, but I think it's the least Gadot-like they've produced. I don't like the sloping forehead and pointy nose, and most people will expect better from them. - has her for $235. - Sideshow has for for $235 as well. 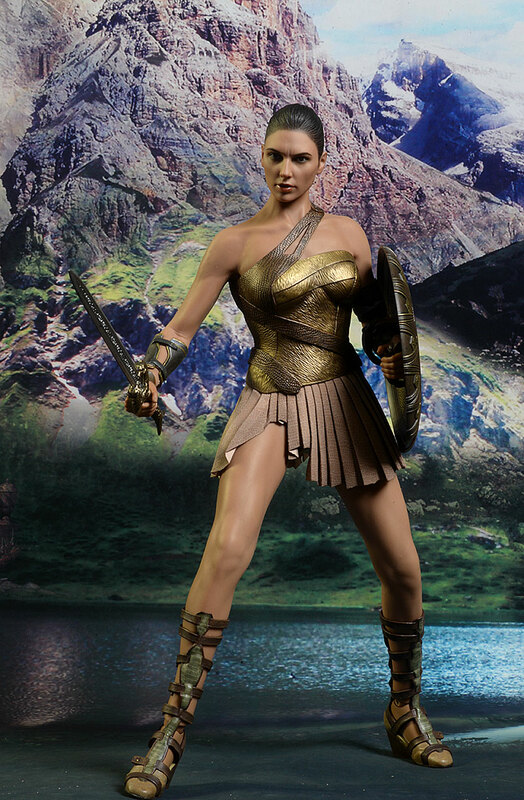 Other Hot Toys Wonder Woman figures include the Batman Vs. Superman release. You should also check out the One:12 Collective version.